Violinist Tomas Cotik was studying at the Glenn Gould School of Music in Toronto when he auditioned for the New World Symphony. Seven years later, Tomas is a professional and a member of the Delray String Quartet, and he's still applying the lessons he learned from founder and artistic director Michael Tilson Thomas. "He's very inspiring," Tomas recalls. "He also inspired me to follow at some point my own projects and follow my dreams." 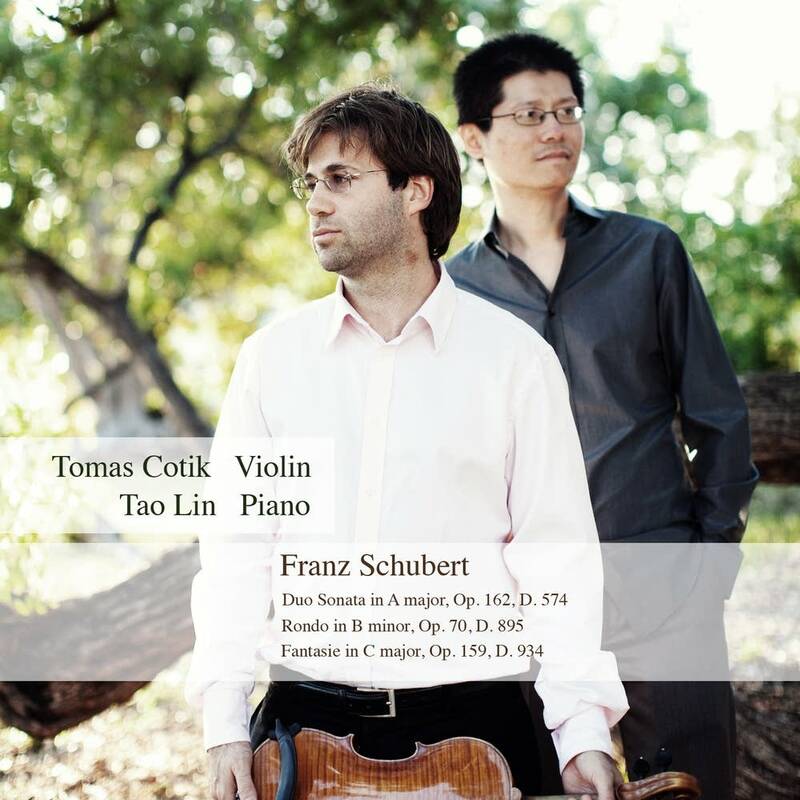 Tomas Cotik has numerous professional dreams, the most recent of which is his sixth recording, a collection of chamber works by Franz Schubert with pianist Tao Lin. "I love these pieces, they mean a lot to me," Tomas explains. "And this recording is a dream come true, something I wanted to do for a long time." Tomas is so passionate about this project, it has since become the focus of his doctoral dissertation at the University of Miami's Frost School of Music. "And I feel a very big responsibility when recording this repertoire that has been recorded already a number of times. That's what made me research and go deep, to be sure that I know as much as possible about this music, about the context of the creation of these pieces, about Schubert's life, about performance practices in Schubert's time." Tomas has made some intriguing discoveries about those performance practices. He says the tempos used in Vienna at the time are a bit faster than originally thought, and the piano's use of pedal is also very subtle, which Tao Lin demonstrates very effectively in the Duo Sonata in A Major. "Well, in the Andantino, one of the interesting things is that there's a pedal marking by Schubert... but he marked very few times, only for special effects. So in this recording we try to use the pedal in the piano as little as possible — only for very special moments." "Also with the vibrato — we know that in those times, they did vibrate but only some notes, not every single note, and there was no continuous vibrato. So while we recorded with modern instruments and I would say aesthetically our approach is relatively modern, we tried to make sure that we incorporate that understanding into our approach. "With the tone of the violin for me, sounding sure is incredibly... for example, in the fantasy — in the middle part of the fantasy — is a set of variations on a lied that Schubert composed five years earlier speaks about love from a distance, which is probably that paradox of beauty and suffering together. When I try to express that with the violin... I'm going for a sound that both moves you and touches. but also that is ethereal and impalpable." Schubert's Fantasy in C Major and his Rondo in B minor, both of which appear on this recording, were influenced by the same Czech violinist, according to Tomas. "I think these pieces do have some Czech influence, Both of Schubert's parents came from what later became Czechoslovakia. And he composed those pieces for Josef Slavik. He was a virtuoso. He also was compared, at those times, to Paganini. And I see those hints of Czech character but also in a very special kind of virtuosity. Both of those pieces in the opinion of many musicians are among the most challenging pieces for violin and piano." Violinist Tomas Cotik is always up for a new challenge. His next project with pianist Tao Lin celebrates the music of Astor Piazzolla, the most famous composer from Tomas's homeland of Argentina.